Dr. Gregory Henderson is a dermatologist who practices in Palos Verdes and Redondo Beach. He is board certified in dermatology, and sees patients of all ages. He treats medical and surgical conditions of the skin and hair, including acne, eczema, psoriasis, rashes and skin cancer, and strives to provide the highest quality care to every patient. He always welcomes the opportunity to explain diagnoses and treatment plans to patients and their families. Dr. Henderson received a combined medical degree and Ph.D. from the University of Southern California and the California Institute of Technology. His completed his internship at the Harbor-UCLA Medical Center and his residency in dermatology at the Mayo Clinic in Rochester, Minnesota. He received his undergraduate degree from the University of California, Berkeley. 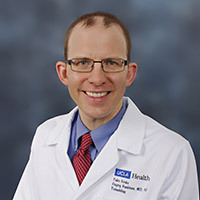 In addition to his clinical responsibilities, Dr. Henderson is a clinical instructor in dermatology at the David Geffen School of Medicine at UCLA. He has a passion for teaching that extends to UCLA residents and medical students, other physicians and his clinic patients. He also publishes research in medical and scientific journals, and has presented at national and international conferences.